Wow! is a fantastic new series that is full of only the best and most amazing facts. Wow! Animals is full of extraordinary facts about a wide range of creatures. Discover that goats have rectangular pupils, that gorillas can catch human colds and that rhinoceros beetles can carry up to 850 times their own weight. 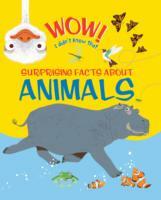 This is a lively, fun book about animals that is certain to make you say Wow! again and again.